Whoo! 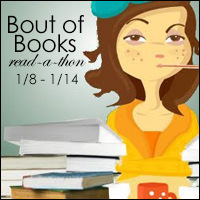 It's time for Bout of Books 21!! I have fallen in love with this readathon so much that I look forward to it and get excited every time. I can't wait to dig into my TBR pile and see what I can accomplish. Bout of Books is a ton of fun, so if you're interested in checking it out yourself, click on the links above or the button at the top of the post for more information! Hope you join in! These will probably change and I'll also be including what I read with my family before bedtime each night, but this is my goal for now! I think including what you read with your family is an awesome and personal touch! Happy Reading! I'm glad you're joining us! I hope you have fun and good luck with your goals!